After an initial intention in 2011, ‘A Critical History of Contemporary Architecture: 1960-2010’ by Elie Haddad and David Rifkind is now available for pre-order from amazon.com. Whilst teaching the ‘Contemporary trends’ course in architecture at the Lebanese American University, Dr. Haddad discovered the need for a comprehensive reference on the matter. Initially, he thought he could write the whole book himself, but given time limitations and the scope of the regions to be covered, it became clear to him that it would need to be a collective effort. So the first step was to recruit some colleagues who were experts in specific areas, who in turn recommended others, until they had a comprehensive coverage of architecture from around the world. Also, for the editing process of the work of about 20 authors, he sought the help of his long time colleague David Rifkind who accepted to be co-editor on this work. The book took around 3 years to complete from the initial proposal and recruitment of chapter authors, to the final realization. This book is a collection of 22 chapters that cover the developments in architecture from 1960 to 2010. This work proposes a broad survey which consists of two parts: first a presentation of major movements in architecture after 1960, and second a geographic survey that covers a wide range of territories around the world. Each chapter will be written by an expert in the field, following a critical approach to the architectural and urban developments in each area. The choice of 1960 is not absolute, and does not imply that architectural developments around the world take a radical new turn after this specific date, but is used as a benchmark from which to re-assess later trends in architecture. This date is of course important in that it followed the last CIAM meeting, which signaled a turning point for the Modern Movement, at the beginning of a decade that witnessed the appearance of seminal texts by Aldo Rossi and Robert Venturi, and as a prelude to the first revisionary movement following Modernism. 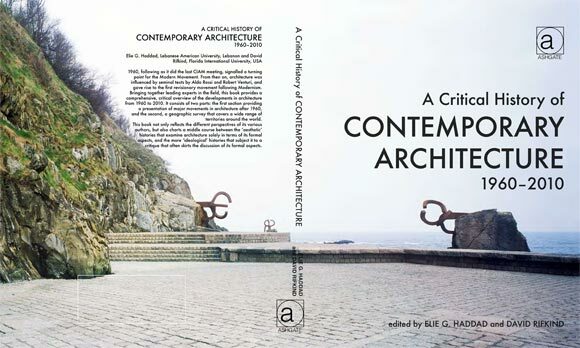 This book will reflect the different perspectives of its various authors, but it will also attempt to chart a middle course between the aesthetic histories that examine architecture solely in terms of its formal aspects, and the more ideological histories that subject it to a critique that often skirts the discussion of its formal aspects. In a sense, this work will attempt a middle ground between the opposite positions of William Curtis on the one hand, and Manfredo Tafuri & Francesco Dal Co on the other. Dr. Elie Haddad is a Professor of Architecture at the Lebanese American University in Byblos, Lebanon, where he has been teaching since 1994; and currently Dean of the School of Architecture & Design. He has completed his architectural studies at the University of Pennsylvania where he earned his PhD in Architecture in 1998. His research interests cover modern architecture and architectural theories, an area in which he has contributed several articles in local and international journals. Among his publications: Christian Norberg-Schulz and the Project of Phenomenology in Architecture in Architecture Theory Review , Charles Jencks and the Historiography of Post Modernism in The Journal of Architecture , In Nietzsche's Shadow: Henry van de Velde and the New Style in Architecture in Architecture Theory Review , and Against Reification: Re-reading Manfredo Tafuri in Datutop . Dr. Haddad also published a translation of Aldo Rossi’s Autobiografia Scientifica into Arabic in 2011, and served as the Translation Director of the Center for the Study of Architecture in the Arab Region (CSAAR) from 2006 to 2008. Dr. David Rifkind holds a Doctor of Philosophy degree from Columbia University in 2007, and a Master of Architecture from Mc Gill in1997. He is presently Associate Professor at Florida International University, teaching in the field of Architectural History and Theory. He taught previously at the University of Virginia, at Parsons School of Design, and Columbia. Dr. Rifkind earned several research grants among which the Graham Foundation Institutional Grant for 2008-9; the Cejas Strategic Initiative Grant in 2009 and the Wolfsonian-FIU Research Fellowship for research on Italian colonial urbanism and architecture in East Africa. He has contributed several articles to academic journals among which “Interama: Miami and the Pan-American Dream” in Cite, n.78, 2009, and “Furnishing the Fascist Interior: Giuseppe Terragni, Mario Radice and the Casa del Fascio,” in arq – architectural research quarterly, June 2006. David Rifkind maintains also an architecture practice with his wife, Holly Zickler. Beirut (2005-2007), by Hale Tenger at the Freer and Sackler Galleries in Washington.